Do you have a child who needs a little extra help with schoolwork? Or do you want your child to get ahead of the curve? If you want your child to catch up or get ahead, give Rookiebuy Mobile apps a try! We have a team of child education professionals, each with more than a decade of experience. We cover all grade school subjects, from science and math to language and arts. So, if you need a helping hand, don't be afraid to try out our mobile education applications! 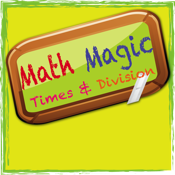 Math Magic Multiplication and Division is designed in a way that kids can memorize multiplication in just taps and swipes motions to see questions and answers. Our experts suggest that it's is best to learn multiplication and division at the same time to realize the correlation of each other. This application allows to prompt multiplication in right to left swipe and division in left to right swipe and just simple tap to check your answer in your mind. Test section are divided in two sections: Times and Division. You can challenge your newly learned skill and see how many you can answer in given time. Newly added 2digits x 1 digit practice section will help to understand how carrying and regrouping values in multiplication. Test result email functionality is added for parents to work with their kids do multiplication and division progress. Parents will receive tests scores with all questions and answers whether they are correct or not. Keep track your kids multiplication/division progress and help them the area that students struggle with the most.